Before cities waste more time and money fumbling, let’s first describe how train stations should serve the 21st Century. Which of these encourages you to travel by train? New York’s former Penn Station was cathedral-like, an elegant concourse and suitable setting for life-long memories. Above, witness today’s concourse; so over-crowded you feel as if you could be trapped in a pen and cannot get out.Symbolizing how America would lead in the 20th Century, Penn Station outdid Europe’s best. Then sixty years later, Penn Station became a metaphor for American transportation mistakes. In 1964, short-term economics demolished it. Ever since, the substitute has aggravated New Yorkers daily. They repeatedly have planned to make another station worthy of the world’s greatest metropolis. But, these civic campaigns lurch from one unnecessary obstacle to the next as the entropy of our government demoralizes all but the most stout of heart. This series will shows how economics and politics can merge to make central stations into centerpieces of sustainable transit in major North American cities. Of course, we have to start with the politics we’ve got. This is not encouraging… at least on the surface. But despite today’s low points, we should recall how civic movements preserved stations nationwide. Fearing Penn-like debacles in hometowns across America, stout hearts now have preserved 32% of Amtrak stations by putting them on the National Register of Historic Places. This great success repurposed many rail stations as community institutions. While many are barely kept alive as reminders of the prospering people we used to be, many stations today also could help our nation benefit from good transportation economics again. Stations should signal our national intent, much as they did early in the 20th Century; called by some as the American Century. But, face the facts: our politics restrain the benefits of transit. Civic efforts to save a building are no match to change the outdated transportation agencies we keep alive despite their strategic failures to serve citizens, businesses and taxpayers alike. In analyzing Penn Station, we see its biggest flaw is faulty governance. This series explores how this problem is common to other cities and, then, prescribes how each locale can redevelop its station into its centerpiece for sustainable transit. Today’s flurry of plans to improve central stations are either insufficient for the future or, worse, will repeat past failures. If efforts in transit towns such as New York, Chicago and San Francisco are fumbling, then car-dominated cities have a slimmer chance of success. But, their chances improve when they take steps — even modest ones — to remake the rules for land use and transportation so transit systems can compete on a level playing field with the car. 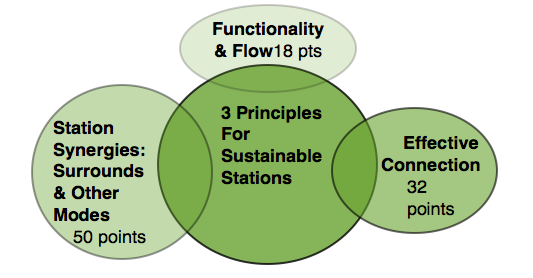 What Makes A Station Sustainable? In this series, I review several central stations in North America to start defining a sustainability for transit that goes beyond helping the environment – one that also aids economic growth and helps achieve fiscal balance. In addition to a narrative, the analysis of each station details a scorecard that I adapted from an article titled “History and Prospects of the Rail Station” by Chris Hale from the February 2013 “Journal of Urbanism.” My adaptation is structured on Professor Hale’s three integrating principles; although the most heavily weighted principle also borrows from the concluding lessons of the seminal book The Transit Metropolis. For “Functionality & Flow”, 18 of 100 points can be awarded for two internal station criterion: platform protection, safety and passenger flow; and secondly, concourse flow to shops and exits, or waiting areas … and, generally, trying to make the station somewhat pleasant amidst the rush hour crush of humanity. For “Station Synergies”, 50 points can be awarded for a variety of criteria including vision, leadership, proximity and integration to pedestrian sheds of the CBD, transit agency competence, station business strategy, integrating transit cards, reasonable transfer fees, and trying to level the rules by correcting the underpricing of automobile travel. If you’d like to see the detailed scorecard, here is one as completed for Philadelphia. To organize the individuality of America’s diverse train stations and learn the similarities in their evolution toward sustainability, I propose four main categories. After the below introductory paragraphs, each category will have an example analyzed in a subsequent article that will be accompanied by its detailed scorecard. A. The Likely Sustainables. While most cities plan to reutilize their central station, these places are actually doing it well. These stations serve compact cities and these economic advantages will help their transit system achieve fiscal sustainability in, let’s be realistic, the next two decades. Example: Philadelphia’s Center City stations. B. The In-Excusables. Some stations should be leaders in Category A, but they have a fatal flaw. While serving relatively good transit metropolises (by American standards), these stations have one obstacle (often lousy politics) that blocks them from fiscal sustainability. Example: Chicago Union Station. C. The Economic Engines. These stations are leading their systems to boost downtown economic growth; but, they must overcome long-term obstacles before their transit systems can get on a path of fiscal sustainability. These are usually neighborhood problems such as poverty. These regions (or often sub-regions) have long-term plans to coordinate their land use and mobility practices, but realistically they lack the tax revenue to attract private capital on good terms for the public. So if economic growth generates greater farebox revenue (instead of more cars), then this creates capital for public investment. Example: Newark Penn Station. D. The Environmentals Only. These stations are not expected to do more than help their region meet federal clean air standards, a low standard for environmental sustainability. To reach higher levels of sustainability, these stations need another path because two strategic obstacles block them. First, Category D stations usually have a very small chance of contributing significantly to their sub-region’s economic growth; basically, too few people use transit to reap real economic benefits. Second, Category D stations have virtually no chance of leading their transit systems to fiscal sustainability; typically because there is too much sprawl and too much subsidy for autos and too little political will to change any of this. These stations appear to constitute about half of the 50 noteworthy stations being considered for this project. Because that is such a large number and because they are mostly Sunbelt cities that I have not studied in sufficient depth, these will be covered in the future. The Golden Era of rails created many of America’s most inspired civic buildings; symbolizing the public-private partnerships that built the key transportation technology of the world’s leading manufacturing economy. Their deal was simple: Uncle Sam gives corporations the land to build the world’s best railroads to move the materials and people. 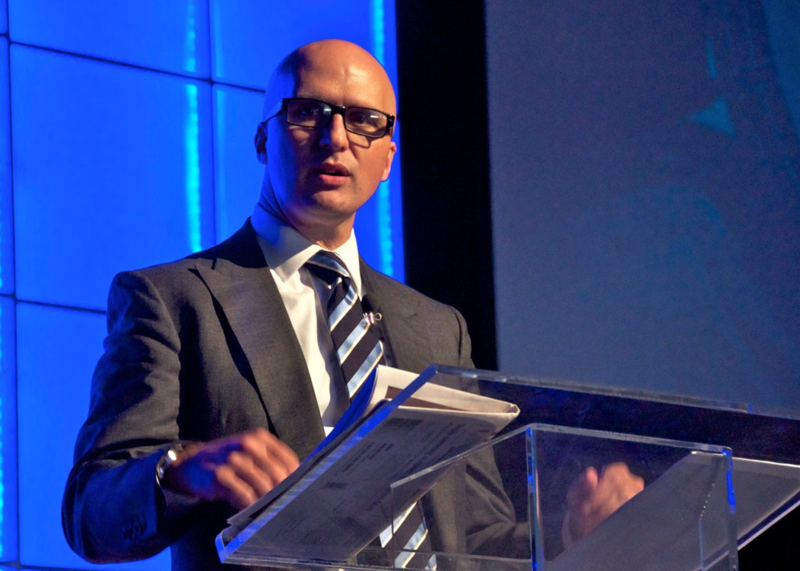 The deal stuck: we became history’s fastest prospering nation. That smartly-incentivized deal trumpeted its success by building the last generation of great stations, most designed between 1905 and 1929. That partnership crashed into the Great Depression. Think of its replacement as the New Deal. Passenger rails and their stations were not included as this mid-Century deal evolved in the 1950s to foster a consumer economy that heavily sold cars. Our car culture is still fervently loved by Middle America. Today’s efforts to revitalize stations are stumbling badly and costing more than we seem to have. To succeed, efforts must be accompanied with new rules for a deal that allow stations and transit to serve as tools to promote economic growth for households and communities. Clearly, the rules for a 21st Century transportation deal will be far more complex. Unlike the 19th Century, the land already has been given away. Nor can today’s governments who are perpetuating the car culture be trusted to institute new transit taxes. Nor should we trust them; having become broke and, now, probably lost the consent of the governed… or, at least for now, taxpayers. Because stations can serve as symbols for transit to help supplant the auto addiction, redeveloping stations are important testing grounds for transportation’s 21st Century deal. How stations evolve and get applied to individual cities and metropolises certainly makes for interesting challenges. But developed well and using inspired placemaking, these stations might even win back enough of that love from America’s middle class. To varying degrees, most stations reviewed in this series have a common obstacle: the experience outside of the rail car is, let’s say, uninviting. There is no need to repeat here the litany of how the bankruptcy of commuter service and Amtrak’s lack of imagination has reduced rail station quality to sad, low levels over the last five decades. However, there is a Simple Solution: Design stations so they are great places. 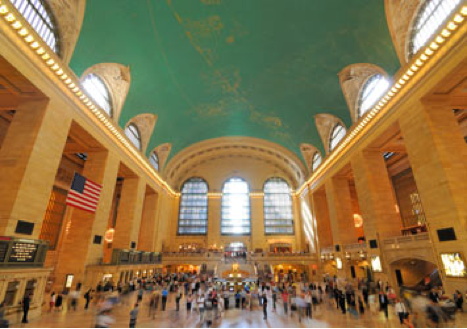 But, here’s the rub: we cannot afford the greatness of Grand Central anymore. Yet, each station can still be great for their town by contributing to its economic growth. To get beyond pretty places, our notion of Sustainable Design must prove how stations and transit serve Americans better than cars. Since cars are fast becoming unaffordable to more and more households and cities, transit advocates have our key economic opportunity to leverage. Elevating stations as a priority results only when public and private investment increases in the central station, its network and their surrounds. This goal must out-smart the persisting tendency for city centers to move from stations and toward non-transit suburbs. While there are many causes, most relate to government’s outdated laws discouraging real estate entrepreneurs from arresting decline by using the economic advantages of compact redevelopment near transit. My proposal for more Sustainable Stations is a synthesized consensus more than it is anything new: compact and mixed developments multiply the types, times and volume of passengers that use the station’s network. While “Urbanophile” readers and planners largely agree that Transit Oriented Development is necessary, doing it sufficiently cannot happen when governments are broke and our laws remain lousy… or, at least, our institutions still work against redevelopment. When not on its track to sustainability, each city needs to develop new leverage — its specific deals — to make transit into a priority that can start to supplant our costly dependency on cars. Having achieved its goal of saving stations but not achieving their economic viability in many cities, the national movement to save stations can use this series to re-strategize its participation in helping create vibrant central stations that maximize the growth of its surrounds and transportation networks. Preservationists can integrate more fully with the broader civic movement that needs to advocate for and protect the huge public investment needed to update transit and put it on paths to fiscal sustainability. In developing this paradigm, the next article will introduce you to “The Sustainables” by analyzing one of North America’s great success stories: how through-routing has helped Philadelphia use transit significantly better. 18 points for flow versus 50 for vision? Really? Not that integrated fares are unimportant or anything, but pursuing that is completely independent from any and all intercity train station design issues. 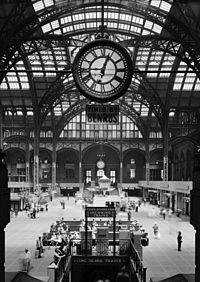 About the only thing Penn Station needs to do to improve integration is to integrate the train arrival and departure boards and the TVMs, and that’s multiple orders of magnitude cheaper than any serious redesign of the station, while requiring nontrivial changes to interagency cooperation. 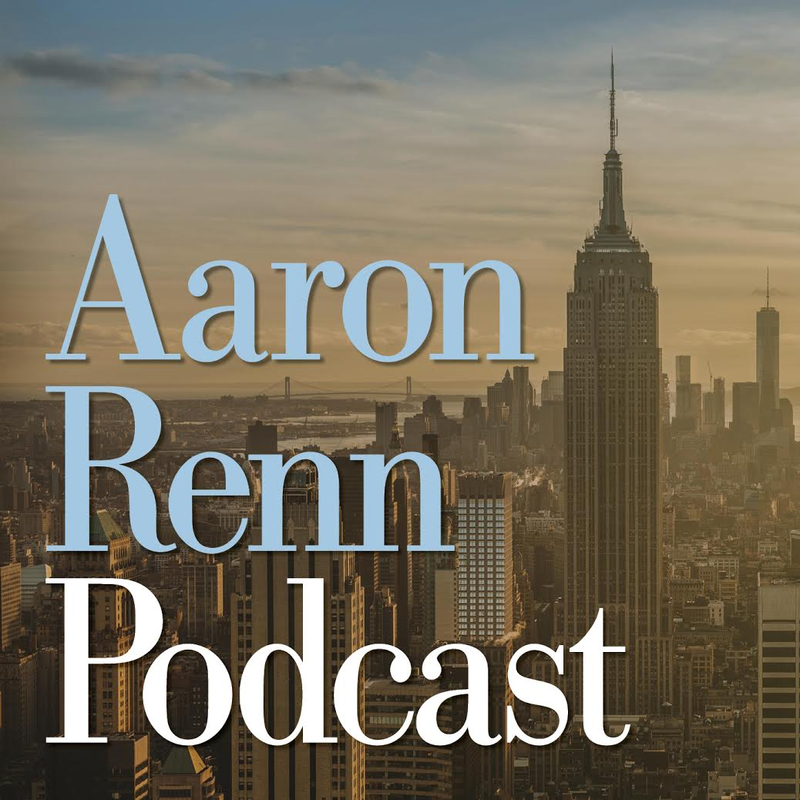 I’d like to raise another point about NY Penn Station that I think Alon Levy may have overlooked–and that is that the travel experience for rail customers borders on miserable for departing customers. The waiting areas for passengers are little better than holding pens for cattle and it creates confusion (especially for the casual rail user) because train gates aren’t posted until about 10 minutes before train time. Imagine going to an airport and being told to wait in an area like the food court with hundreds of other passengers until 10 minutes before departure and then find your way to a departure gate before your plane leaves. I’m not blaming Penn Station employees or operations for this–its just that its not a comfortable feeling for anyone who doesn’t know the station–and it certainly does nothing to encourage the casual rider. Even as someone who regularly travels by train, this waiting until the last minute then forcing my way through crowds of other passengers who have no interest in boarding your train or yielding to you so you can get to your boarding gate is annoying. And I have frequently heard other people say they don’t want to travel by train again because of this chaos. I don’t know how to fix this problem at Penn–but it would make things far more enjoyable if there was a way to separate passengers in some manner so that they could wait close to their departure gates in smaller crowds rather than standing around with hundreds of other people all wondering from where their train was going to depart. And this condition doesn’t just exist at the Amtrak waiting room, but at all 3 waiting areas. However I think the Long Island and New Jersey Transit commuters have just become hardened to the conditions. But surely making the departure areas more civilized would benefit everyone who uses Penn Station! So many failed attempts at a Gard idea.I get a puking at our Washington reps for overlooking the great potential of a gateway by rail.Nothing makes me fume more than our ignorance to the tracks already laid.Nothing makes makes me want to wring the necks of golf club farts that don’t see the benefits of high speed rail. I am looking forward to the analysis of North America’s #1 railway station: Toronto’s Union Station with 65 million passengers each year. Thanks for your comments. I feel much the same way about NYC’s Penn Station. I’ve concluded that understanding it requires a 6th sense and that a 7th sense is required to transcend it… all of which New Yorkers seem to have; but then, they probably learned it on the subways. All around, Penn is a special case; but also typical of many larger stations in that transit is a regional problem and can’t be solved until we get regional governments with real authority. But more on that theme as the series develops. I do hope to write a review on Toronto’s station as it appears to be among “The Sustainables” from my preliminary scorecard. Its key drawback is that Ontario’s politics almost rival those in my state, Illinois. Cleveland’s Terminal Tower/Tower City Center would also make a very interesting case study. This station would appear to have all the necessary attributes to be successful: (a) central location at the heart of the downtown business district in Public Square, (b)multiple rapid transit rail lines that feed to nearby suburbs (most notably the Shaker Heights), the downtown flats district, and a West Side line with a direct link to the airport (c) walking connections to large quantities of office space at multiple price levels (e.g., historic skyscrapers, landmark towers, and recently built modern office space) (d)and indoor walking links to two upscale hotels (Ritz Carlton and Renaissance), the Tower City shopping mall, a newly opened casino, and two sports arenas (Quicken Loans arena for basketball/hockey/concerts and Progressive Field, home of the Cleveland Indians). It is the ultimate “mixed use” transit-orientated intermodal facility with the potential for even more regional rail, river, and public transit links (e.g., regional commuter rail to nearby Lorain, Lake, and Summit Counties, and a downtown terminal for the Cuyahoga Valley Scenic Railroad). Yet the station and complex has struggled and is one of Cleveland’s most under appreciated and under utilized assets. Thanks for tying some loose ends I had on Baltimore. Because of them, I wasn’t able to get the Big Picture and sketch a preliminary scorecard. 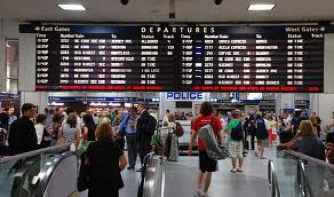 Take a look at Philadelphia (today’s post) for how to make Connectivity work… and then look for next week’s post on Chicago’s Union Station to see that connectivity in Baltimore is not at the bottom. Thanks. Very helpful structure you have given me to understand Cleveland. I have no plans to review Cleveland this year; but I expect to writeup St. Louis as an Economic Engine; which may serve as analogous to Cleveland.